Before you open your eyes or say a word each morning, a few precious moments have the potential to place you on the pathway of peace and hope. Make these seconds count. They are more important than we can even imagine! In Wake Up Smiling Audrey shares her very personal journey of taking three simple Bible verses and believing them in a way that some may say is outrageous. Living heaven on earth has become very real for her, and every morning she wakes up with hope. If you're ready to live, dream, and experience freedom from worry and fear, Jesus really is as close as the mention of His name. He's been waiting to share His secrets with those who will abandon all and say, "I'm ready." God has a recipe for hope for you. It's practical, it will turn everything around, and it starts as you wake up. Your daily process will become your destiny. God's original design is for you to live life with Him. And it starts now. Audrey's writing and her ministry are real, raw, and honest. The truths in her book, Wake Up Smiling, will help others held in captivity find their freedom. The healing in her journey with God will give so many their own pathways. If you are looking to be challenged and set free, this book is for you! Practical and powerful, Wake up Smiling reflects Audrey's authenticity and zest for life. Each chapter is packed with doable strategies for joyful living. Audrey inspires us to allow the peace of God to rule in our hearts--no matter the circumstances. What a timely message for a weary world! This is the type of book that you will turn to again and again for encouragement and renewed hope. 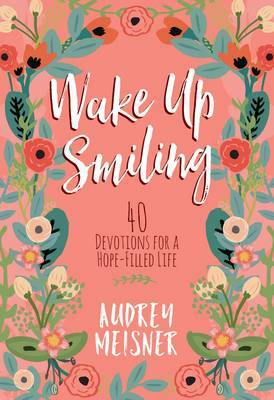 Audrey's book, Wake Up Smiling, is not just a daily devotional. It is a training manual with practical steps to living a hope-filled life. She leaves nothing hidden as she shares with vulnerability and openness about her own journey to personal victory. She combines her story with biblical truth to make this a very powerful read. We highly recommend diving into this book and letting your life be impacted daily by the truth of her message. As Audrey says, "Let's make a choice to line up with heaven and live in hope every day." Anyone who meets Audrey is instantly caught up in her zest for life, her love for Jesus, and the contagious joy she emanates. So I read her new book, Wake Up Smiling, with great anticipation, knowing I would be encouraged. But I found so much more. In this book she shares hard-earned wisdom that is made easily accessible and can be practically applied. Her passion will inspire you, and her story of grace will disarm you from any dread of the future so that every day you can confidently Wake up Smiling. Who doesn't like a smile? Whether it's from a child or your best friend, everyone loves a smile. Wake Up Smiling by Audrey Meisner is a wonderful book. You might just Wake Up Smiling as a lifelong habit after reading through this daily devotional. Allow Audrey to take you by the hand and show you her discoveries. You'll learn the secrets of maintaining your peace no matter what surrounds you and how to keep your Joy-Light switched on. And when people ask you, "Why do you wake up smiling?'" tell them about this book! You better buy a few, because you'll want to share it with your friends. Enjoy the next forty days of your joyous journey into finding your smile again! It's been over twelve years since we personally witnessed Audrey experience a dramatic breakthrough when she completely received the beautiful forgiveness of Jesus. It was tangible and real. Since that moment when she "threw off" the cloak of shame, she hasn't looked back. We prayed for her that night in her parents' living room, and since then we have seen her walk in an authority of joy and freedom that is contagious and miraculous. You can't help but smile and receive practical strategy as you follow the journey to happiness that Audrey has walked and laid out here in this book. Read every page of Wake Up Smiling. It will help you see how much you were created for new levels of breakthrough! Wake Up Smiling is a book every person should read. The reason this book is so powerful is because I know this about Audrey Meisner. She is completely authentic. Her words emerge from a life of applying God's truth. There's nothing theoretical in her teaching. She is completely transparent. For the benefit of others, she never holds back. She is a true Jesus girl who bases her every belief in the life, teaching, death, burial, and resurrection of the Lord Jesus. Audrey Meisner is by nature a happy, joyful person. But that's not what qualifies her to write this book. Audrey has walked through deep valleys of grief, heartbreak, and impossible circumstances, only to emerge with profound passion and a firmer grasp of God's great love for her and for others (like you). This is not a surfacey book about the benefits of smiling (although, Audrey definitely points out the benefits of smiling). This is an honest look at what hinders our joy and why it matters. Do you believe it's possible to embrace life with a heart of expectancy and faith? Do you want to wake up smiling because you're someone Jesus loves and sings over? Read this book. It's like a cup of cool water: good for the heart and good for the soul.